When the Loveday family face danger they unite and face their enemies with courage and conviction. 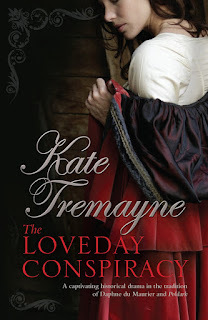 Three conspiracies weave through this exciting new addition to the Loveday Series now available in Hardback. Extracts will soon be revealed. Hope you like the picture of a few of the stones of Avebury ancient circle. This is where the wedding of Adam and Senara took place. 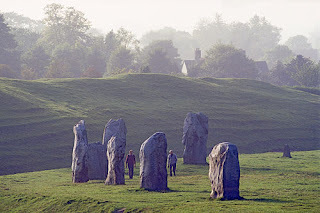 Checkout Avebury on google for lots more pictures. It is one of my favourite places. Here are some more answers to questions. Q.. What will it take to have your books available in the USA? A. Unfortunately I have yet to sell the American Rights but my agent is trying hard. Never underestimate the power of recommendation and for readers outside the UK I always recommend the UK seller The Book Depository which discounts books and offers FREE WORLDWIDE DELIVERY. Q.What does your study look like? A. It is stacked up with books and alongside my desk is a bookcase of current research books for the Loveday Series. On one wall is hung portraits or my husband, one grandson and myself and my husband has promised to complete the set of our two children and other four children. I also have some of my wildlife paintings and seascapes on the opposite wall. My desk is in front of double glass sliding doors that look through to a Victorian style conservatory and out into the garden. It is a lovely view of trees and shrubs and I do try very hard not to get too distracted by the birds that have been nesting in the boxes. Q. Do you write at a computer? A. After an automatic dishwasher a computer is the greatest writing aid to producing work. When the writing is slow I have to limit my time getting sidetracked on the internet and getting dragged into an online Sudoko game. Q. Do you agonize before "killing off" a character? Especially because it means the end (or should I say "dead end") of a certain number of plot lines. A. The death of a family member is always traumatic to write as they are like my extended family. Killing off Harry Sawle was more therapeutic and gave me a sense of bringing an evil villain to justice. Q. Within any given novel, do you know everything that is going to happen to your Loveday characters? Have there been surprises? A. All plots are movable feasts where the Lovedays are concerned. Some of the most dramatic scenes have happened because one of them dictated what would happen rather than follow what I thought would occur. Q. Did you set out to be a writer? A. It was always a burning ambition of mine as I always had stories in my head that wanted to be told. Q.Did you ever have another career? A. I trained as a legal personal assistant and also had several secretarial jobs. I did not become a full time writer until 1990 when my two children had left school. Q. What has been the greatest joy of your writing career? A. Having my first book published and realising that I still had many more stories I wanted to write. Getting my first fan letter made me feel really special and that I had succeeded. I still love hearing from readers by email or post and such contact makes all the long isolated hours worthwhile. Marilyn asked several questions on my last post. I'll answer them in stages so that other readers can also give feed back. 1. Did you have formal training as a writer? If so, what was it? Ans. I did attend a creative writing workshop to learn the techniques and get what help I could. I also then joined the Romantic Novelists Association where it was possible to meet agents and editors and also hear them give talks and I also attended writing conferences. It can be a slow process getting published. A novel will take about a year to write and that does not guarantee success. My fourth novel was published. 2. Please tell about your experience when your very *first* book was published. Ans. I still feel the same every time a new novel of mine is published. It is always a great thrill. 4. For your Loveday characters, do you draw on the nature of your friends? your family? Ans. That could be a good way of losing family and friends . I shall put more of this in the Just For You section in the paperback of The Loveday Conspiracy. 5. So much happens to each Loveday character. How do you keep it all straight in your mind over so many years? Ans. I have a head for trivia and after a year of writing about a particular family drama it tends to stick in my mind. I constantly have to recheck historical facts. I am currently putting together a Just For You section to go at the end of the paperback of The Loveday Conspiracy. This was also done for the paperback of The Loveday Revenge. 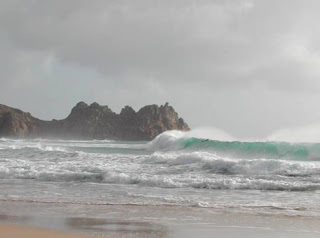 There will be the Prologue of The Loveday Vendetta (This is still the working title of the latest Loveday), Some writing tips on how I plot my novels, What books I am currently reading or have inspired me, and a general section where I answer questions I have been asked either in this blog or from your emails. If you have a question you would like to see in print either ask it here or email me at Katetremayne.com. I will answer as many as space will permit. I have to send these to my publisher at the end of next week. I hope you like the painting. It is a Cornish seascape I painted at a recent art course on seasscapes that I attended. 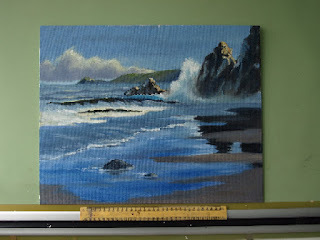 I find painting seascapes, landscapes and wildlife very relaxing and a new challenge as I had no formal training. It has been a fabuous week with first Tesco doing a summer long promotion on The Loveday Secrets. My preview hardback copy arrived hot of the press from the publishers of The Loveday Conspiracy and looks gorgeous. It is published at the end of the month - more on that and an extract later. Then I learned that one of my Pauline Bentley novels written for Mills & Boon was recently republished in Switzerland. I wrote this over 12 years ago. If that was not enough to send my mind spinning into overload a long phone chat to my wonderful editor Sherise had us discussing the latest plotline which she adored and of course titles. In my current work in progress Rowena and Bryn come to the fore with their stories to be told. Bryn has remembered his past and seeks to bring the man who murdered his brother and mother to justice and reclaim his birthright. Rowena is also saved from a disastrous elopement but she has sent out to prove she is more her father's daughter than has inherited her mother's scheming blood. The question of titles came up and I rather fancied The Loveday Rebels as in depicting that all offspring in their late teens rebel against rules and convention. Also the country is still at war with France and the family has its own internal battles as well as national wars to fight. The other choice was The Loveday Vendetta. Now I am torn between the two. Any personal preferences from my readers? Your views are welcome. The book title often reflects the tone of the subplots so is essential that I get it right. And don't worry Adam, Japhet and Tristan will still be playing prominent parts in the new plotlines. I am posting on uk historical romance with this great news today click on the link at the top of the page for more information.